Unless you’ve got the moves of the dazzling “Uptown Funk” treadmill dancer, working out on a treadmill can feel like an endless slog on a revolving belt that leads nowhere fast. Which is what often happens to your motivation. In fact, in one study runners were put on treadmills immediately after an outdoor run and asked to run at the same speed. They adjusted the treadmill speed much slower, which researchers felt related to the runners’ perception of speed on the treadmill versus outdoor running. In short, the treadmill pace felt harder at a slower speed. You may experience the same feeling. But it doesn’t have to be this way. Try these fat-burning, boredom-busting tips from top fitness experts. Bonus — you don’t need an hour to get results. In the case of some high-intensity programs, 20 minutes may be more than enough. Most workouts can all be adjusted for your available time, be it 10, 20 or 30 minute sessions. For a motivating 30-minute workout, Tom Holland, exercise physiologist, triathlete and author of “Beat the Gym,” recommends a routine he calls 10-10-10. You work out at a warm-up level for 10 minutes (at a perceived exertion of 5 on a scale of 1 to 10), then do 10 minutes of a challenging workout (a 6 to 7 intensity) and then back down to a level 5 for the remaining 10 minutes. Break it down into smaller increments for shorter workouts. Put together your own mix and use your tunes to tell you how hard to push, says Holland. “When slower paced music comes on go to an incline.” Let the beat of the music determine your intensity and the length of your intervals. If you watch TV while on the treadmill, go at a comfortable pace during the show and hammer it out during commercials, says Holland. This can be too much for an hour-long show but works best with a 30-minute program, where approximately 10 minutes consists of commercials. “Throw a towel over the monitor so you’re not focused on the time,” suggests Holland. Incorporate side shuffles into your intervals by running or walking on an incline for a minute, then lower the platform and side shuffle for 30 seconds and repeat. “This works great for tightening up the outer and inner thighs,” says Neal Pire, exercise physiologist at HNH Fitness, a medical facility in Oradell, New Jersey. If you’re agile enough, try the grapevine, where you alternate crossing one foot and then the other in front of you in a crisscross side shuffle. “Hold on with one hand if you’re unsure of your balance,” says Pire. Apps like MotionTraxx (first workout is free) offer treadmill workouts that not only keep you motivated but also help you work harder than you’d do on your own. A trainer (Amy Dixon) takes you through a high-intensity workout of hills and varying speeds, much of which you choose according to your fitness level and goals. Other popular treadmill apps include BeatBurn Treadmill/Outdoor and Virtual Active, which takes you through scenic running trails around the world. Change the actual skill you’re using on the treadmill and use some variety to keep from getting bored, says Pire. Lunges work well and also target glutes more than flat walking. 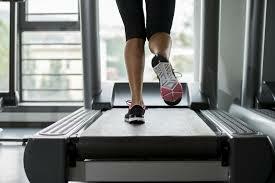 Set the treadmill to an incline (start with 5 to 6 percent) and, if you need to, use your hands for balance. Lunge deeply with each step (form is more important than speed for this move). Start at around 2 mph and try one minute of lunging followed by 30 seconds walking for 8 to 10 sets.